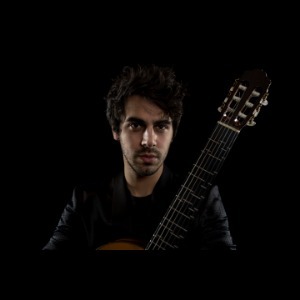 Mak Grgić has been called a “gifted young guitarist” by The New York Times. He has had the good fortune of working with some stellar collaborators including Martin Chalifour (Concertmaster of The Los Angeles Philharmonic), cellists Jay Campbell, Joshua Roman, Ashley Bathgate (cellist of the Bang on a Can All-Stars) as well as John Sant’Ambrogio (former principal cello of the St. Louis Symphony Orchestra). Others include The Assad Brothers, flutist Christopher Matthews, Paul Vasile and Stephen Ackert on the organ, guitarists Daniel Lippel (their contemporary music duo is now called FretX) and a newly formed duo with flamenco virtuoso Adam del Monte (Duo Deloro), as well as Christopher McGuire, percussionist Ian Rosenbaum, and guitarist-composer Nejc Kuhar, with whom Mak made his first album, sponsored by The National Radio of Slovenia and the Ministry of Culture in Slovenia. Mak’s performances with orchestra include Arvo Part’s Fratres and the Concierto de Aranjuez of Rodrigo with the Maribor Opera Orchestra. Their collaboration yielded the following comments from the conductor Maestro TaeJung Lee. “It was a great pleasure to collaborate with Mak Grgić, a wonderful guitarist from Slovenia. Together we performed Arvo Pärts Fratres and the Concierto de Aranjuez of Rodrigo with the Maribor Opera Orchestra. He is not only an exceptional guitarist, but also one of the most diverse young artists with whom I have worked. RTV Slovenia Symphony Orchestra under Maestro Ivo Lipanović, the Croatian Chamber Philharmonic with Maestro Mladen Tarbuk, the SNG Maribor Symphony Orchestra under Maestro Simon Krecic and St.
Petersburg Symphony with conductor Vladimir Lande, former principal oboe of The St. Petersburg Philharmonic. His list of recitals is abundant and include recitals include numerous appearances at The Allegro Guitar Society, as well as the Sarasota Guitar Society, Portland Classic Guitar, Austin Classical Guitar in recital with Martin Chalifour, the University of Las Vegas in Nevada, the National Gallery of Art in Washington D.C., the Newman Center for Performing Arts, Denver, Strathmore Hall in Maryland, Pepperdine University as a guest of Christopher Parkening, Portland Classical Guitar, the Minnesota Guitar Society, Guitar Festival Mikulov, Northwest Guitar Festival, Piran Music Nights and The Sounds of Six Strings, Cankarjev Dom, Slovenia as well as well as Arts at the Park in NYC, the New York Classical Guitar Society, Microfest in Los Angeles, The Beyond Microtonal Festival in Pittsburgh, Guitar Art Summer Fest, and in Korea at the Music Now Festival. Other dates have included performances at the Grande Auditorium di Espinho, Espinho and Teatro di Fafe, Fafe Municipality in Portugal, Teatro Cervantes de Bejar, Salamanca, Castile-Leon in Spain, International Music Council of the European Broadcasting Union in an all instrument “New Talent” Competition in Bratislava, representing the Republic of Slovenia as well as The Dallas Opera with Chamber Orchestra in performances of Peter Maxwell Davies’ The Lighthouse. Mak is a passionate advocate for new music and has premiered numerous new pieces, including the music of Nina Senk with JACK Quartet, the music of David Crowell, (composer and saxophonist of the the Philip Glass Ensemble), music by Christian Carey, Julia Adolphe, Thomas Kotcheff, Sven-David Sandström, Hakki Cengiz Eren, and William Harvey, who is presently living in Afghanistan. Born in Ljubljana, Slovenia, he studied guitar in Zagreb with the revered Ante Cagalj at the Elly Basic Conservatory of Music and obtained his Bachelor’s Degree with Alvaro Pierri at the Universitaet fuer Musik und darstellende Kunst in Vienna, Austria. At the moment he is pursuing his Doctoral Degree at the USC Thornton School of Music as a student of William Kanengiser and Scott Tennant of the Los Angeles Guitar Quartet. He is also a teaching assistant at USC under the direction of Brian Head. His charitable activities include fundraising for Bosnian children with financial issues, including a recent recital in Zenica, BIH, where funds were raised for a local orphanage. Mak currently plays Antonius Müller, 2009, a MC Jose Ramirez, 1966, and a double top guitar made by Slovenia’s brilliant luthier Samo Sali.